Process of Creating a Gasket - P.D. Peterka & Associates, Inc.
Gaskets are some of the most important parts of any machine. Though they’re small and simple components, these seals ensure that gases and liquids don’t seep out of a sealed connection or space, which can lead to various safety hazards or equipment malfunctions. Gasket materials are diverse. Choosing a gasket depends entirely on the materials the machine is constructed from and the work the machine is designed for. Some equipment uses foam or rubber gaskets, while others are better suited for silicone or polyurethane, sometimes even paper. Whether you’re die cutting gaskets, or cutting them by hand, it is essential to find out what material your equipment requires first. Is the gasket material strong enough to withstand the pressure exerted by the machine’s materials? Is the gasket material capable of withstanding corrosion from the gases or liquids it is sealing against? Is the gasket material able to withstand high enough temperatures? Once you’ve considered those important questions, gasket construction can begin. At P.D. Peterka & Associates, we die cut our gaskets because it is not only more efficient, but the end product is more precise. The fewer the imperfections, which are inevitable in hand cutting, the more effective the gasket. 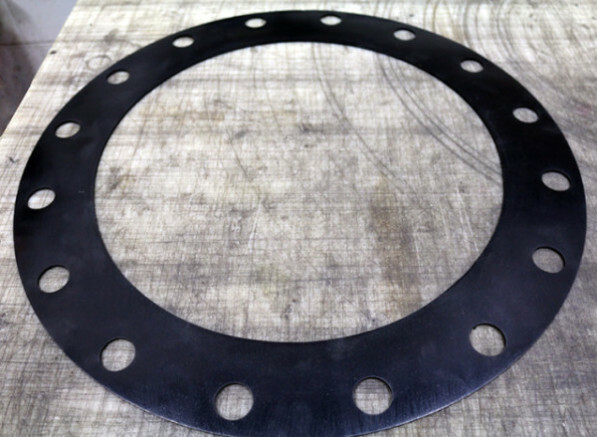 The amount of gasket material needed is measured out and the dimensions of the gasket are marked to either create a die or hand cut the piece. Then, with either a die cutting machine or a razor knife and misc circular punches, the gasket and its bolt-holes are cut. It is important in the measuring process to exactly match the gasket’s bolt-holes with the bolt-holes on the machine or connection to ensure a proper fit. Once the gasket has been cut, it is then put into place on the machine to check that it will properly seal. Then, if needed, it is permanently adhered to the machine with a sealant, such as automotive silicon. Once the sealant has set, the gasket seal is ready for use. Not all gaskets require a permanent sealant, though. Most rubber or foam type gaskets don’t require any permanent sealant because these materials self-seal to the matting surface. If you have additional questions on gasket cutting specifics, give us a call or send us an email via our Contacts page, and we’ll see how P.D. Peterka & Associates can help. of the finest sites on the web. I ‘m going to recommend this website! like you comprehend what you’re talking about!